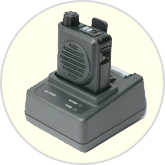 Single channel 2-tone voice pager sold with or without charger and rechargeable battery. All RIC can set as different tone alert type. Loud clear voice level: 85 dba at 12 inches distance. Desk type charger as standard. Green LED blink with monitor ON. Audio lock on Green LED ON. Auto reset with delay N revert with carrier squelch. PTL option, push to listen feature. Disable power OFF by programming / disable Vibrate. VHF 143~174MHz, UHF 406~512 MHz. 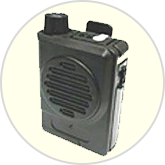 Narrow band & wide band 2-Tone Decoding Format.